Cheat Sheet – Confused skin: what do you treat first? Only a very select few have what would be termed ‘normal skin’. Which is why I find it odd it is called ‘normal’. It’s far from the norm for most people! For the rest of us, there are multiple issues to contend with. 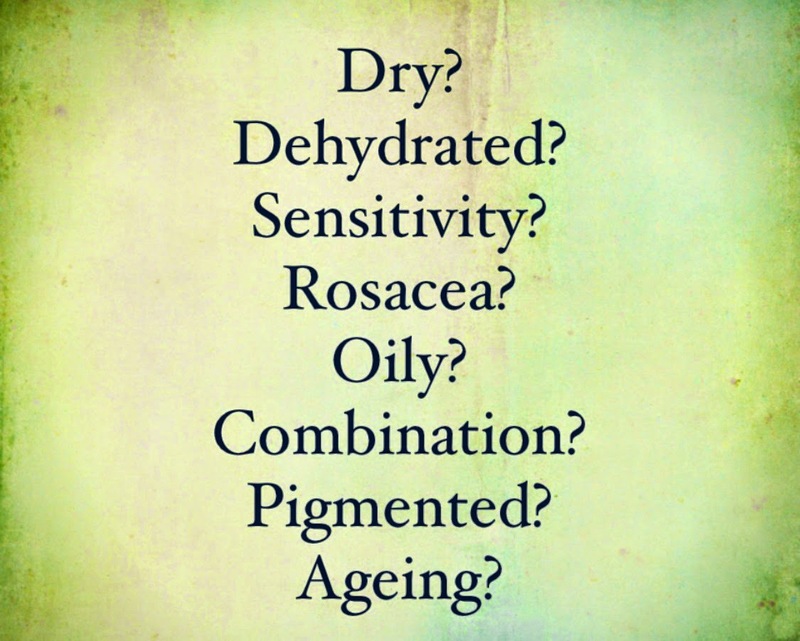 Pigmentation, dry, oily, combination, sensitive, rosacea, dehydrated – you name it, you probably have at least one of them. But what if you have more than one? What if you have 3 of them? FOUR of them? It would not be uncommon to see a dehydrated, hyper-pigmented, sensitive, ageing skin with hormonal breakouts. Dr Leslie Baumann wrote about her 16 skin types years ago – and she was spot on, although I think there’s more than that..
What do you do in that situation? You treat by the potential your issue has to cause pain and/or long-lasting damage such as scarring or broken capillaries. For that reason, the first thing you do is take care of the sensitivity/rosacea. Inflammation will exacerbate the rest of your issues. For example, if you had rosacea and acne, and used a foaming traditional acne ‘wash’, your cheeks would scream at you. That’s not good. That’s not what you need or want for your face. Sensitivity is King. Best product choice: moisturiser for sensitivity. Followed by Dehydration. A dehydrated skin drinks anything you put on it, but you have to do it repeatedly. Your anti-ageing serums end up just filling a gap in your skin rather than actually doing their job. If you are dehydrated, which 95% of us are, you need to treat the dehydration. You can leave the house in the morning with a perfectly hydrated, bouncy face and be dehydrated to the point of it showing on facial machinery by mid-morning. No matter what you do, what you use, how old you are, and your lifestyle, you can be dehydrated just by waking up. Dehydration is Queen. Best product choice: the toning phase – both acid and spritz and serum. Acid on cotton pads to gently strip it back and spritzes and hyaluronic acid serums to follow. Neither of these two products should irritate any of the other issues…. Then you can start to be more general. Oily – acid toners and essences are great as are the right moisturiser. Don’t over-embrace oil-free and foaming. Acne – acid toning phase is key, as is your moisturiser. Please, please think carefully about how you will go about replenishing the oils in your skin if you use an oil-free moisturiser. If you want to try and keep your oil under control by mid-afternoon, use an oil-free moisturiser if you want to – but use a facial oil dedicated for acne/combination underneath it. I promise a drop or two can make all the difference. We’re ahead of the game now, the market has plenty. The old ‘foam wash, strip tone, oil-free moisturiser’ routine is dead and buried. Or should be. And finally, a special mention to the sufferers of melasma – or chloasma as it may be called by your midwife if you’re pregnant. Melasma and pigmentation are different things. Pigmentation, for example, can be caused by sun damage, acne scarring, picking spots or inflammation and can normally be treated with topical products – glycolic, kojic and azaleic acids, retinoids, and licorice for example with some success. Your best product choices would be peels, targeted serums containing those ingredients and SPF. Melasma can be triggered by those things but is also linked to hormones (hence the link to pregnancy, the pill and peri-menopausal women), illnesses, such as Addison’s Disease, Lupus and Celiac disease among many others. Female sufferers outnumber male 9 to 1. 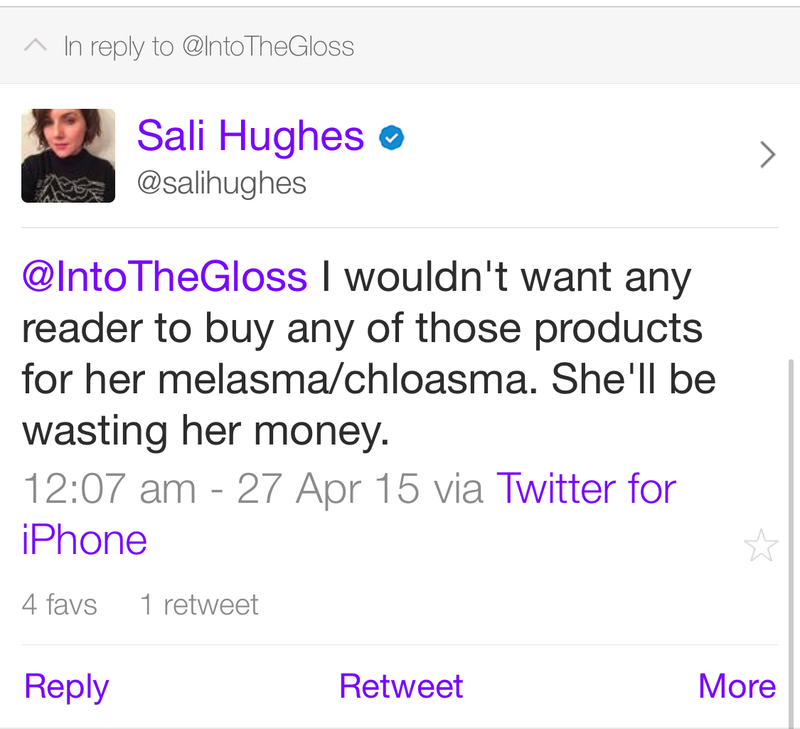 Sali*, a melasma sufferer, tried to get them to talk about it/correct the piece, to no avail. You best product recommendation for melasma is time, a laser and sun block. I had mild melasma with pregnancy, it eventually cleared up on its own. Some people aren’t that lucky. Yes, peels (clinical) can help, but if you want it gone, it’s a laser. And the bad news is that even if you stay out of the sun and wear a complete sunblock, it will probably come back, because your melanocytes hate you that’s what it does. Please make sure you know what you have before you part with your hard-earned cash. 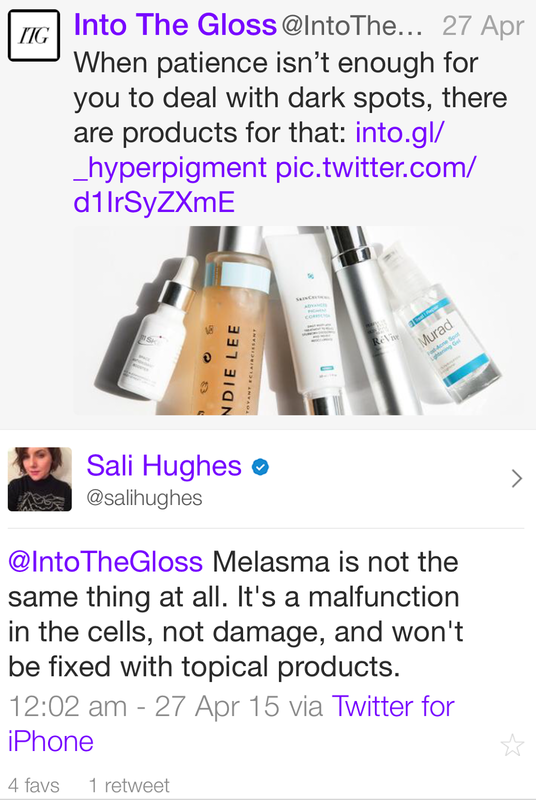 *I obviously asked Sali’s permission to post these screen-grabs and mention her melasma and I refer to the ITG article purely because it led to questions from readers for both Sali and I. Previous Post Comments Part 2.